DFC, Chinese 3 Star Wings, Cloud Banner, and one other Chinese medal; DFC & Air Medal with CNAC. Pre AVG: National Guard Reno – S.F., S.F. City College, Pensacola Naval Air Station, Torpedo 3, USS Saratoga. Known as Raines because his birth certificate had his name misspelled. It would have taken 6 months to correct and would have delayed his Navy training. His father corrected the error in 1947. A distant relative of Catfish was in the Donner Party – his Mom’s side of the Breen family. AVG Service: One of the youngest pilots in the AVG at 23 years of age. Only native Nevada pilot in the AVG. Born in Palisade, NV, which is a ghost town today. 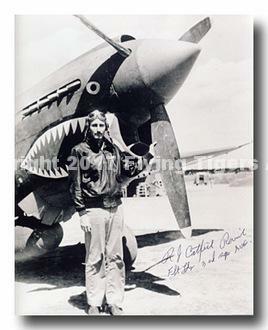 One of the original 10 investors in Flying Tiger Line in 1945. Captain, Flying Tiger Line. About 1952, founded Mercury Air Refueling with Tom Haywood and Duke Hedman. Tent of Honor Award 2002 – highest national award in Arabian horse racing. Several of Catfish’s horses still have track record standings in California. All of his breedings’ names are preceded by P.S. (Purple Sage).